Jagatheeswaran Senthilvelan is currently the Head of Innovation and Technology for a company called Fluxgen Technologies which provides cost effective IoT solutions for energy monitoring and management requirements. 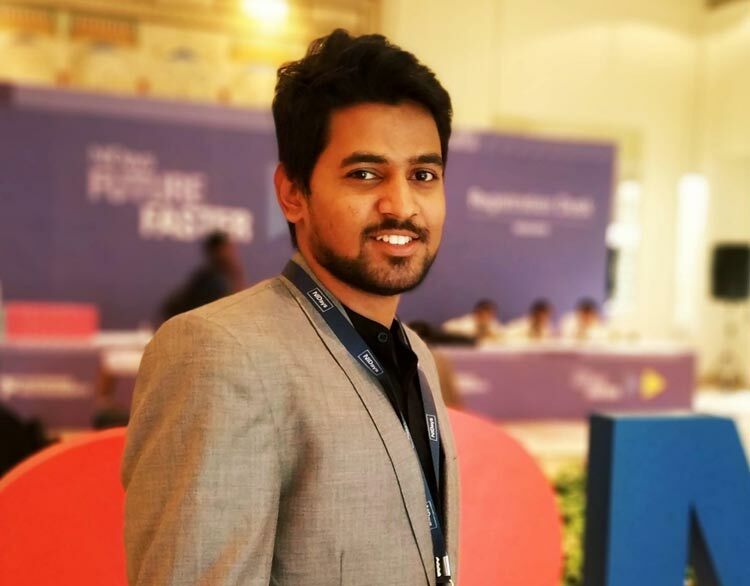 He has been involved in the development of various end to end IoT solutions; one such example is to measure and manage the water infrastructure at Titan Industries (Hosur) using IoT and completely handled the deployment and commissioning from client’s facility. He has also been the Tech Coordinator for Cisco LaunchPad Cohort 3, which is an Elite Startup Accelerator program which will be held for 6 months annually in India where the top 8 startups in India will be selected. Currently, he is focusing on Protogen which is is the academic wing of FluxGen Engineering Technologies Pvt.Ltd. ProtoGen provides products and services to build a solid foundation and familiarize learners with current trends in technology. Excited by his works, we were curious to know more. So we approached him with few questions, and he was generous to provide us the following answers. What are the objectives of FluxGen? What leads to the rise of ProtoGen? FluxGen Engineering Technologies is on a dutiful mission to help mitigate water and energy crisis across the globe by deploying state-of-the-art solutions in water and energy monitoring and management by providing cost-effective Internet of Things (IoT) solutions to identify consumption pattern and reduce the expenditure. While developing our products we learnt more about the importance and the need for Industry 4.0(Industrial Internet of Things) which will be in high demand in near future. Industry 4.0 is a blend of advanced analytics, Big Data, Robotics & Automation, Artificial Intelligence, Internet of Things (IoT) and Process Digitization across the business value chain. According to IBEF, the Government of India plans to increase the contribution of manufacturing sector to 25% of Gross Domestic Product (GDP) by 2025, from the current level of 16%. India is also prepared to face global competition by undertaking the Make in India programme. It is all set to lead the world with Smart Manufacturing. Adopting Smart manufacturing, analytics and IoT will give a new lease of life to industrialization in India. Apart from policy implementation hurdles, one major bottleneck is the fear of job losses owing to Robotics & Automation. A smart strategy to counter this is to upskill workers and millennials in these fields and create a quality workforce. This lead to Starting-up Protogen. What makes ProtoGen unique? How has its journey been so far? Protogen is unique from others in a way that we bridge the gap between the academia and the industry by imparting our knowledge and experience directly from the industry with cutting-edge technologies. We have impacted more than 5000 students and 1000 professionals by partnering with more than 15 industries to upskill the future workforce. We have conducted more than 100 training programmes covering a wide range of technology to build confidence, knowledge and skills among the participants to build their own product prototypes and set up their own startup. What are the steps involved in the process of prototype development? Define your main goal of the project. Start your initial brainstorming with your team. You may know your design obstacles and need to research solutions. Stick with 1 or 2 features, to begin with. Remember this version will be refined along the way. Create your design on paper. Discuss with appropriate partners or stakeholders knowing there will be improvements. Any managers, users, researchers etc. should be included for feedback. Edit your design after discussion with partners or stakeholders. Design from paper to prototype with the top three features of the product which you are planning to make. Keep it very simple. Don't strive for perfection. The user is encouraged to work with the system in order to determine how well the prototype meets his or her needs and to make suggestions for improving the prototype. Note down all the changes the user requests and refine the prototype accordingly. After the prototype has been revised, the cycle returns to (3). (3) And (4) are repeated until the user is satisfied. What is the most challenging part in a prototype development? How does ProtoGen tackle it? How could one arrange the right casing and enclosures for their prototypes? Initial Prototype doesn’t require a sophisticated enclosure design. Best thing I would suggest is there are ready-made enclosures with different IP standards in the market with good aesthetics and also available in different sizes. One can get that and make their product prototype. I will suggest this even for selling it to the early stage customers. Once the product is frozen and ready to market in scale one can go for special design for their product. As a Product Prototype Development Company what is your favorite hardware’s and tools to work with? Why? Where do you spend most of your time in office and how does your workbench look like? ProtoGen also provides a development tool kit called ProtoKit. Tell us more about it. The ProtoKit is an Arduino ­IDE compatible development platform that enables quick-­and-­easy product prototyping. It can interact with real­-world sensors, control motors, display information, and perform near-­instantaneous calculations. It enables anyone to create unique, mind-blowing projects. The ProtoKit also serves as an excellent physical computing learning platform. We’ve designed the IoT Node to be as easy­-to-­use as possible. It can be used to help teach both programming and electronics concurrently – two skills that are becoming significantly important in today’s high-­tech world. It comes with integrity with 5 Wireless Technologies namely: Bluetooth, ZigBee, LoRa, WiFi, GSM. Which according to you is the best cloud service for prototype development and why? I personally think Firebase and Adafruit.io is the best cloud service for prototype development because it is open source and a lot of source codes and tutorials are available for this. And they have very good support in terms of APIs for cross-platform integration like Android, IOS, Web-based apps., etc. How should one select between Bluetooth, ZigBee, LoRa, GSM and Wi-Fi for IoT hardware prototype? Where do you think engineers of today are lagging? What could be its solution? Lack of awareness of the current trends in the industry and courage to pursue their interest is where our engineers lag today. There is a process set already by the education system which drives most of the engineers today to the monotonous jobs, and also they have fear of failure and self-doubt on their career vision. To overcome this they have to keep them updated and aware of what's happening in and around the world. How much ever the engineers are desperate to find jobs, the companies are even more desperate to find the right talent. There are a lot of opportunities available around the world, engineers have to go and grab it. ProtoGen also organizes prototyping workshops called “Protoshops”. What will be covered in this workshop and how could one avail it? Prototyping is one of the most essential skills in this generation. Let it be fixing your table or building your own system at home to wake yourself up in the morning. It doesn't matter if you are an innovator, an engineering student, an entrepreneur or someone with an idea that could help solve the planets greatest of problems. An Idea alone cannot take you the distance, but quickly building it and showing out to the world that your idea really works and has the potential to become something is what matters. This program will give you a head start into the world of Product Prototype development with a specialization in IoT and embedded systems products.